Custom mosaic jewelry box made with jewelry and favorite flowers — yellow tulips and blue hydrangea. A wooden box was finished with clear polyurethane. I then made a design sketch of yellow tulips and blue hydrangea that incorporates some jewelry — earrings, pins and pearls — that has a sentimental value to the client. Blue and yellow stained glass mosaic is hand cut and grouted dark charcoal. 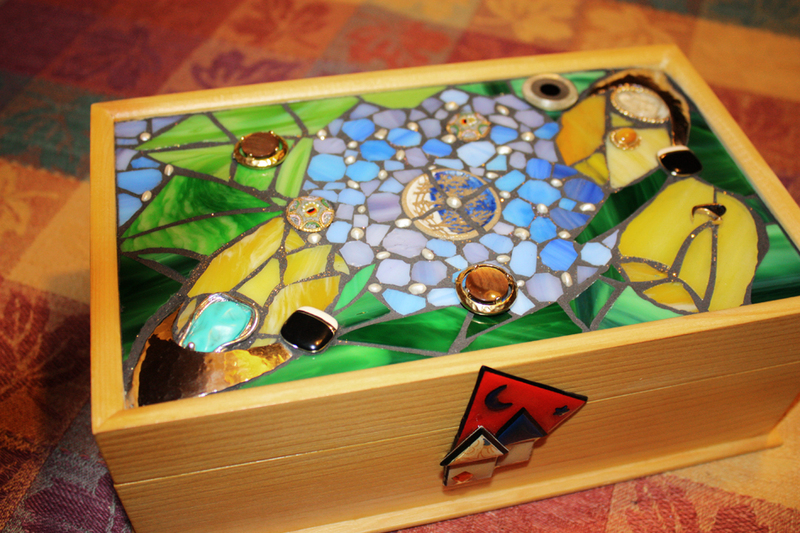 Some jewelry pieces are set into the grout, and some are mounted on the mosaic. Posted on July 31, 2017 November 4, 2018 by iKPosted in wooden boxTagged custom box, jewelry box, keepsake box, mosaic box, yellow tulips.